Inspired by none other than the 26th President of the United States of America, Theodore Roosevelt, this lounge really needs to be seen to be believed. As you approach the entrance to the bar, cast members wait by the door. 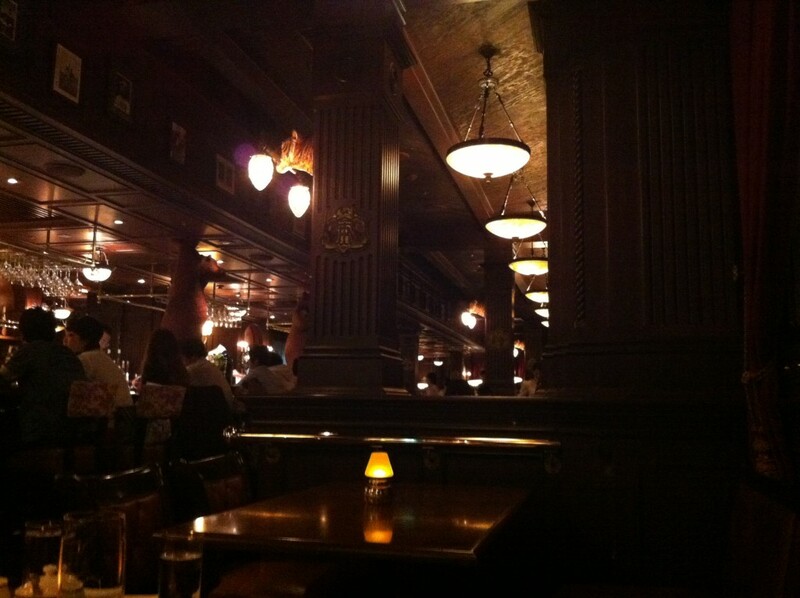 Inside, you can see the polished wooden floor, the wooden bar, set under the dim mood lighting. Something which I say time and time again is that TDR does a brilliant job of setting the scene and making every part of the park feel real. 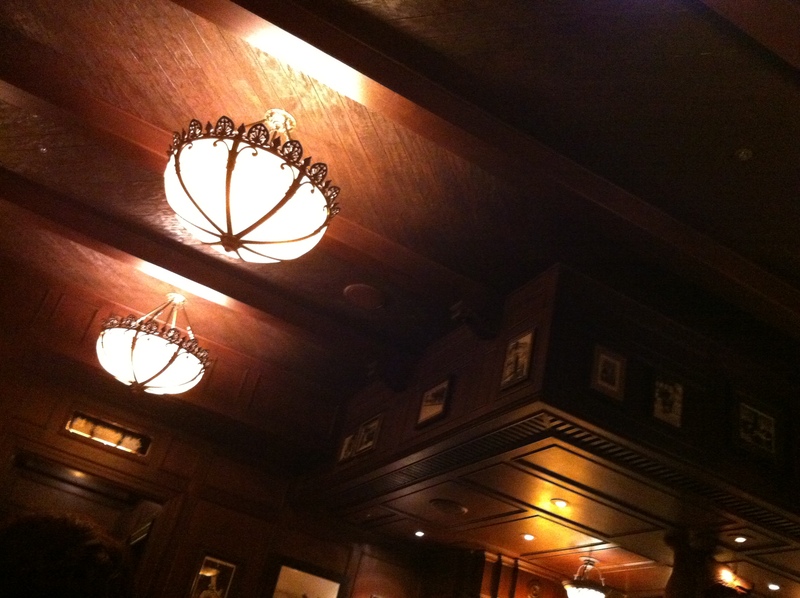 The Teddy Roosevelt Lounge is no exception. In fact, the whole ship, SS Columbia, is worth exploring – I really felt like I had stepped aboard something like the Titanic (impressively, as much as it looks like a ship, it’s not!). The detail is very impressive. 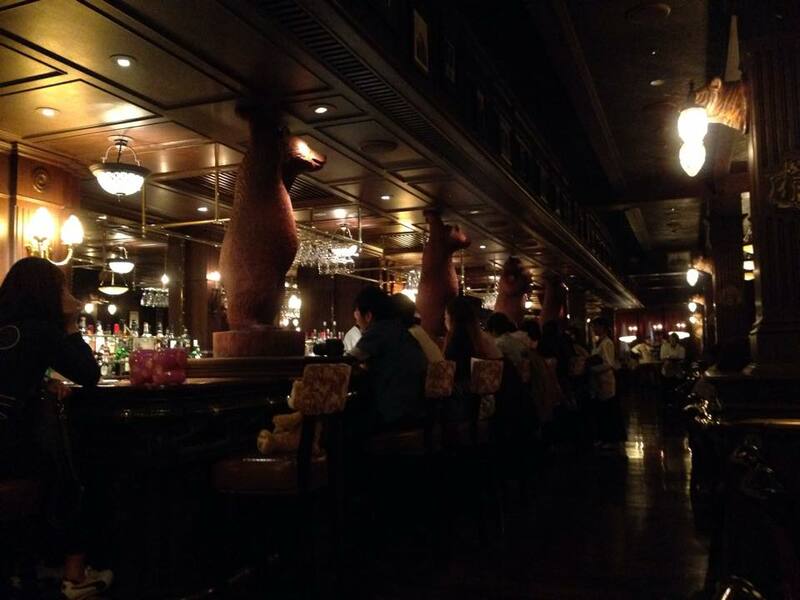 The ceilings are made of wood, the bar and other fixtures around the lounge include carved wood designs, giant bears hold up the bar, and framed pictures on the walls further enhance the theme. I didn’t manage to get any photos beyond the bar area near the entrance, but the area out the back has large couches, book cases and a fireplace. We were seated at a small table near the entrance, and I hope that next time we might be able to get a seat out the back in the lounge area. If it’s busy and the couches and tables are taken, you might still be able to get a seat at the bar for a cocktail. 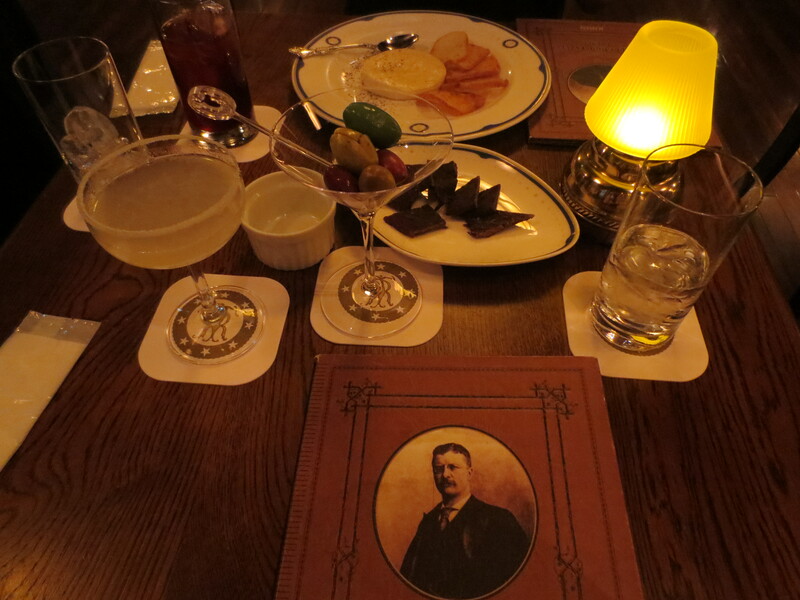 Food and drinks at Teddy Roosevelt’s Lounge seem to be a bit hit and miss. I’ve read some very positive reviews, and it sounds like the food from the mains section of the menu is good. 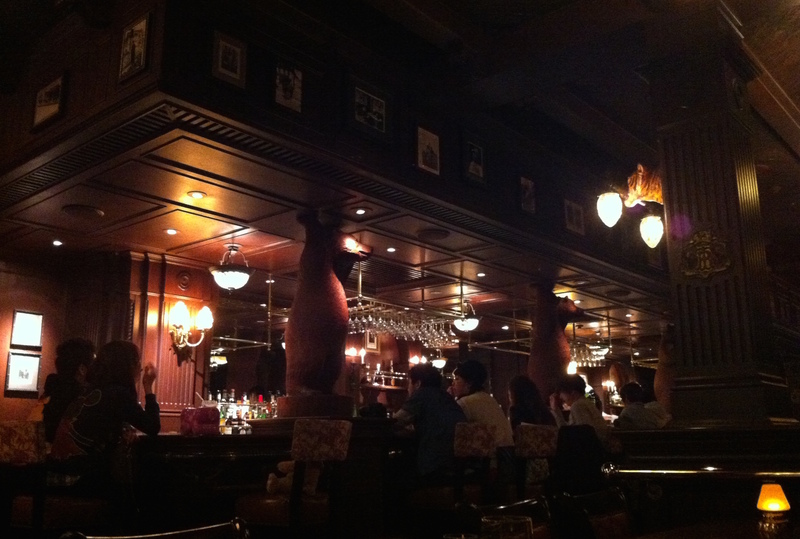 As Disneysea sells alcoholic beverages and The Teddy Roosevelt Lounge incorporates a very fancy bar, you can get genuine cocktails here (another place you can stop for a cocktail at Disneysea is Magellan’s Lounge). Cocktails in Japan do tend to be a lot more reasonably priced than, say, in Australia, and TDR is no exception. I can’t recall the exact price, by my margarita was under 1,000 Yen. It was small, but it was certainly as strong as any other margarita. 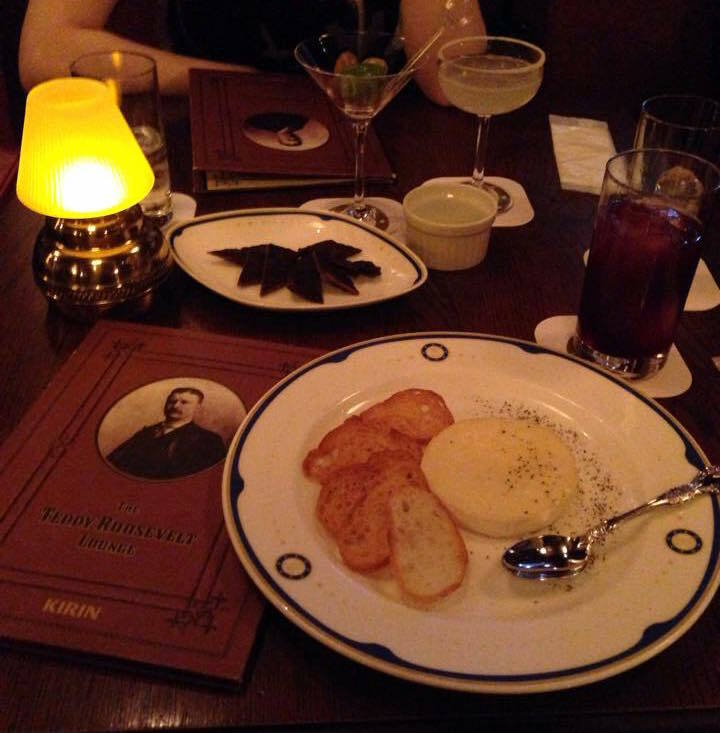 And what better place to sip a cocktail in style than The Teddy Roosevelt Lounge? Appetisers, on the other hand, are overpriced and a bit average. First up, we ordered the beef jerky – 800 Yen for about 8 little pieces of… okay what IS beef jerky? I’m Australian and beef jerky isn’t really a thing here. I think you can buy it along with peanuts at the counter of a bottle shop, but I’d never tried it before. I was curious, so I ordered it. It wasn’t worth 800 Yen, that’s for sure! We also ordered the baked camembert cheese with baguette – 820 Yen. I know that nice cheese is pretty expensive in Japan, so perhaps I should have known better. This kind of money will get you some fairly nice cheese in Australia, even as an appetiser at a bar. The cheese that we got here was like the budget $3 nasty camembert inspired stuff that, uh, I don’t even know who buys that stuff. I’d prefer to have either paid a little more for better cheese, or to have spent that money on something else. Ah well, you live, you learn! Assorted olives cost 570 Yen. How many olives do you get for 570 Yen? Seven. And they’re not any kind of special olives that you can’t buy in a jar at the supermarket, either. In amongst the seven olives presented in a martini glass, there was an anchovy stuffed olive. Now, these are hands down one of my favourite types of olive, but at 570 Yen – that’s almost over 81 Yen per olive (that’s about AU $0.88 an olive) – I’d expect something I couldn’t buy by the jar at my local supermarket. A small 235g of anchovy olives in Australia costs $3.50, and there are 40 olives in the jar. Yes, I counted. That’s less than 9c per olive. At AU $0.88 per anchovy olive (at Teddy Roosevelt’s Lounge), that’s AU $35.20 per jar – more than 10x the price. 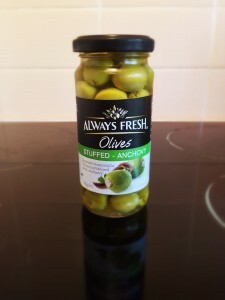 Of course they need to make a profit, and selling seven olives at a time is different to selling a jar of 40, but still! Maybe olives are rare in Japan. Maybe your everyday, garden variety, cheap, supermarket olives bought by the jar aren’t as cheap and common in Japan. I don’t know. What I do know is that next time I’ll save my 570 Yen and buy my olives back home in Australia. 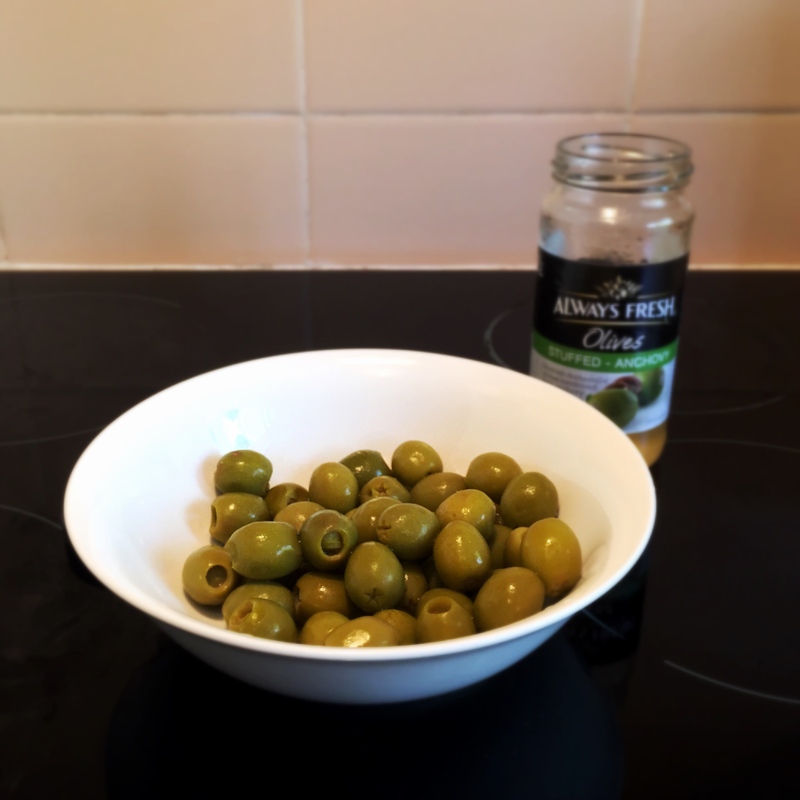 It was worth it for the laugh, when we realised that we were eating the most over-priced cheap, supermarket olives that we’d ever had. I think the moral of this story is that if you’re going to The Teddy Roosevelt Lounge, perhaps order something from the mains, or maybe just a cocktail. Skip the appetisers and get better value for money for your snacks somewhere else in the park. 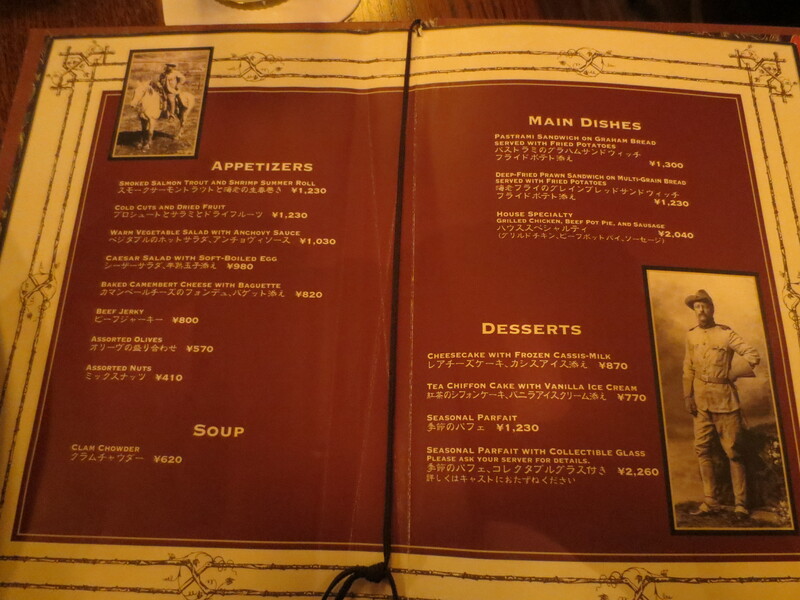 After all, there are just so many great food options at Disneysea. 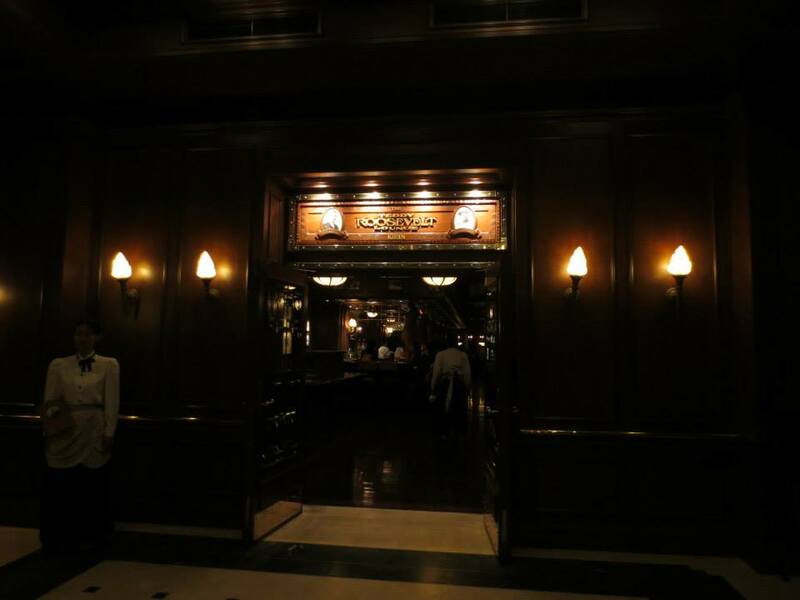 Would I recommend The Teddy Roosevelt Lounge? Despite the overpriced appetisers, yes, I would still recommend it. It’s a beautiful bar and there’s more to see than I was able to get photos of (and the photos I did manage to take don’t do it justice). Even if just to have a look at the lounge, I would recommend it, and if you like cocktails, you may as well get one while you’re there. We’re definitely planning to go there again, and I plan to sip another cocktail while we sit back and enjoy the atmosphere.